1. A simple ultrasound protocol (bilateral B-lines and decreased EF) is specific for acute decompensated heart failure but not at all sensitive. 2. This may save time in making the diagnosis, but further studies are needed to confirm. Acute decompensated heart failure is a common cause for acute dyspnea. The accuracy of history, physical exam, blood tests, and chest xray are not spectacular. 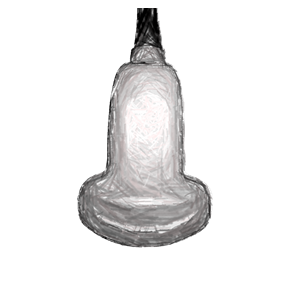 Ultrasound has been shown to be useful, but many people think it takes too long to perform. This study tries to simplify an existing formula to make an easy way to help diagnose this disease in undifferentiated patients. 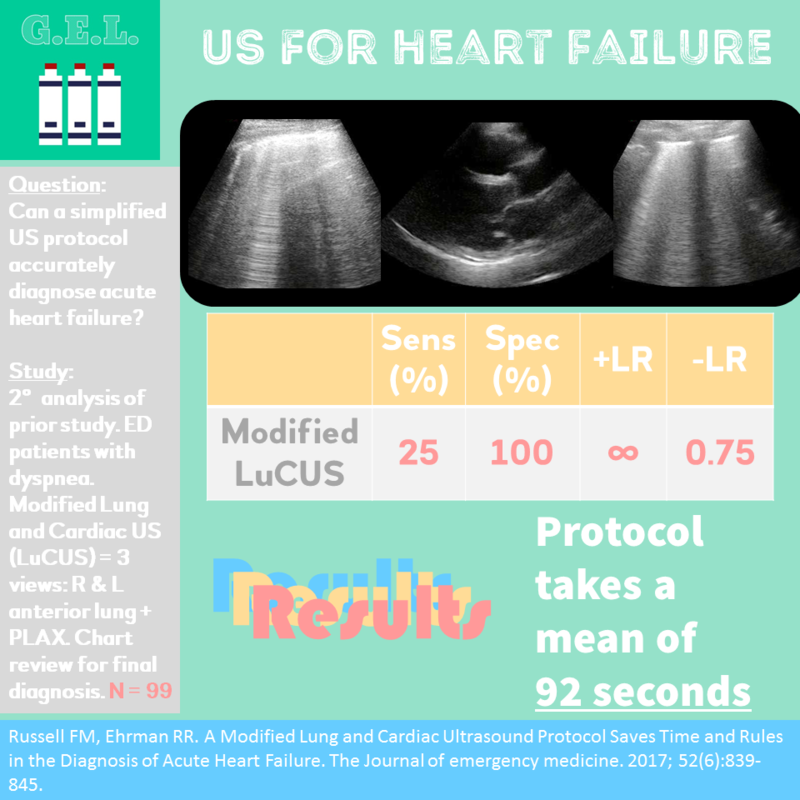 How accurate is a simplified lung and cardiac ultrasound protocol in diagnosing patients with acute decompensated heart failure? Secondary analysis of previous study. Initial study was to determine accuracy of LuCUS protocol. Initial study included 12 views, modified one includes 3. Needed to have all three positive to diagnose as acute heart failure. To determine timing, they used time stamps on images. Time stamp on right anterior lung to the end of PLAX clip. How accurate is the timing calculation? States that modified protocol had a mean of 1.5 minutes, but later states that the rest of the full LuCUS exam would be only 6 minutes, however total test in original study took 12 +/- 4 minutes on average so....something doesn't add up. Either way - we need a prospective evaluation of the time savings. Interestingly, original study had sensitivity of 83% (better as expected) but specificity of 83% (much worse). This shows that you are just making the cut off a little higher for diagnosis, thereby increasing specificity at expense of sensitivity. Since this exam is specific but not sensitive for acute heart failure, authors surmise that you could do this modified protocol and if positive → done, if negative→ do more comprehensive ultrasound exam. Seems like a reasonable approach.